A dental bridge literally bridges a gap in your teeth, creating by the absence of one or more teeth. 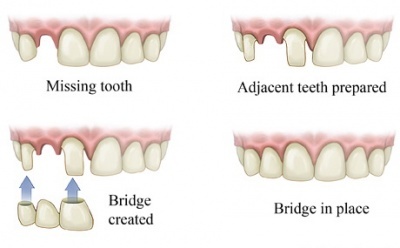 A bridge is generally made up of two or more dental crowns on either side of the gap. These teeth anchor one or more dental implants, taking the place of your missing teeth. This method is one of the most common used bridges in dentistry. In this process the bridge is positioned between your existing teeth to “bridge” the gap left by a missing tooth or teeth. A Maryland Bonded Dental Bridge – This method of dental bridge it may be composed from plastic, metal or porcelain. The dental bridge is normally supported by a porcelain or a metal frame. If a patient has teeth available on only one side of their mouth then in order to support abridge Dr Normatov will use a cantilever bridge. Why do patients need a dental bridge?Patients receiving dental bridges normally don’t want to have a dental implant either due to cost or some other reason. However now that you have a dental bridge you have now been given back your smile and your confidence. This can also help the patient to maintain their face shape. Your smile greatly affects your appearance and getting it back can restore your confidence. Apart from your appearance and the impression your smile makes there are practical reasons for getting a bridge. These can include speaking, chewing and preventing your existing teeth from shifting and reducing the stress on your surrounding teeth. Dr Normatov will first prepare your teeth and fit your dental bridge in two or three separate visits. At your first visit, Dr Normatov will shape and size the teeth that will be used to anchor the bridge so that there will be enough space to fit the device, depending on what type of bridge Dr Normatov is placing. She will then make an impression of your teeth which will guide her in the process of making the bridge. When you return to the dental office for your last visit visit the new bridge will be placed into your mouth and adjusted in place. It is normal when a patient receives a bridge that they return to the office for adjustments. This is a normal process of fitting and adjusting until the device is sitting perfectly. Once your bridge is in place will be able to eat and speak more normally again. Patients have to be careful of eating certain foods and it is always better to stick with foods that are softer until you are comfortable with the device. Once a patient has adjusted to the new bridge you should be able to return to your regular diet.